Are you tired of covering your smile every time you go out with friends and they try to take pictures with you? Does your smile make you feel self-conscious when it should be a tool to help you boost your self-confidence? Thanks to a wonderful cosmetic treatment from your dentist, no longer will you feel the need to cover your smile in embarrassment. From now on, you’ll be happy to flash your pearly whites at your next gathering. Today, we’ll be discussing exactly what porcelain veneers in Copperas Cove are and if you can benefit from them. 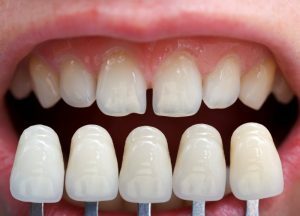 Porcelain veneers are wafer-thin sheaths designed to bond to the surface of teeth. This cosmetic treatment is incredibly popular among some of the most famous faces in Hollywood but is also very accessible to average working people just like you. You can get a smile that you’re proud to show off, not cover in fear of people seeing your imperfections. Additionally, porcelain is a naturally stain-resistant material, so you won’t need to worry as much about foods or beverages staining your teeth while you consume them, at least compared to tooth enamel. Veneers are known to last for many years as long as you take proper care of them like you do your natural teeth. Keep in mind, in order to place your veneers your dentist in Copperas Cove will need to remove a small amount of tooth enamel so the veneer has enough room to adhere. If you want to save tooth enamel, you may want to consider Lumineers instead. According to the American Academy of Cosmetic Dentistry, caring for your porcelain veneers is hardly any different than caring for your natural teeth. This includes brushing twice a day with a fluoridated toothpaste, flossing daily, and visiting your dentist every six months. This allows them to make sure no issues are appearing with your veneers. To protect your veneers even more, consider limiting your consumption of foods that are prone to staining, such as coffee, dark teas, or other foods with a dark pigmentation. Consider purchasing a teeth-whitening toothpaste to remove surfaces stains 2 to 3 times a week. Remember, the better you practice your oral care, the longer your veneers will last. Want to get started planning your smile makeover? Schedule a visit with your dentist today! Dr. Daniel Caraveo earned his Doctor of Dental Surgery degree from the Baylor College of Dentistry. Before that, he worked as a dentist in the U.S. Army and attended St. Mary’s University to earn his Bachelor of Science degree. To learn more about his porcelain veneer treatments or practice, contact him at (254) 547-4866 or visit his website.